Since we added IMAP access to Gmail in October, we've heard from a number of Windows Mobile users that their Gmail IMAP experience wasn't great -- some were receiving blank messages and others could read headers but not entire messages. There are a lot of email clients out there, each with its own quirks, so making IMAP work across all of them can be tricky. We've worked with Microsoft engineers to debug the incompatibilities with Windows Mobile and made some tweaks to our code. As some people have already noticed, these fixes went out last week, so you should now have a better experience reading and sending Gmail messages using IMAP from your Windows Mobile device. If you haven't yet set up IMAP, just follow the configuration instructions to get started. Here's the scenario: you decide to try out a new Gmail feature and suddenly you have some questions. What do you do? Come on down to the Gmail Help Discussion Group. The Gmail Help Discussion Group is an interactive user forum where Gmail users communicate with one another. You can get quick and easy access to information for troubleshooting technical problems, share your wealth of experience with other users, get a fellow user's perspective on something that is confusing you, or just stay up to date with Gmail -- all through this community forum. Tip #1: Someone may have already posted about your topic or question, so search or browse for previous threads before posting a new one. Tip #2: If you're troubleshooting, try to provide as many details as possible. Specific error messages and specific actions that you took can help others understand what you're experiencing and what you've already tried. For instance, if you're having problems sending messages, specify exactly what occurs, any error messages that you receive, and your computing specifications (such as browser type and operating system) to help the group identify if your problem can be easily remedied or if it will require direct assistance from the Gmail team. Tip #3: Keep an eye out for the "Gmail Groupies," a particularly active and helpful bunch of Gmail users who really enjoy sharing their knowledge and expertise. You can recognize them by scanning previous posts and looking for frequent contributors. Whether you want to provide other users with help or have a question of your own, you can join the growing community of more than 200,000 members. A few weeks ago we invited you to share your Gmail stories with the world, and over 1,500 of you responded with emails and videos describing the creative and productive ways you use Gmail. Many of you were practical, lots were sweet, most were clever, several were talented, and some of you provided a good laugh. We can't keep these to ourselves any longer, so we created a collaborative video that combines many of the stories we received. We also want to share some of the great emails you sent, so head to gmail.com/yourstory to check them out. We hope that you'll enjoy the stories as much as we do, and maybe even find some new ways to use Gmail along the way. P.S. It's never to late to share your story. Introducing: shortcut "e." It's a new shortcut key that archives email. You might be thinking, "Doesn't shortcut key 'y' archive email too? Why make a new way to archive?" Well, let me explain. I'm a heavy Gmail user, to say the least--I get 1,000+ emails a day. So to manage it all I have filters that auto-label emails while still showing them in my inbox. Sometimes I read them from my inbox, but many times I click on the label name to pull all of my new mail from a certain category ("label view"). In reading mail from these two views, I noticed a quirky instance where you cannot use shortcut keys to archive email while in label view. Shortcut "y" archives when you are reading mail from your inbox, but it actually removes the label if you read email from your label view. This is because technically, "y" removes the conversation from the current view. In inbox it removes from inbox, and in label view it removes the label. So to archive in the true sense of the word (removing it from inbox view) in "label view," I had to click the "more actions" drop-down menu and actually hand-select "archive." After enabling shortcuts in Settings, tapping "e" will now archive your message no matter what. No more unnecessary mouse movements for me, and hopefully for you. 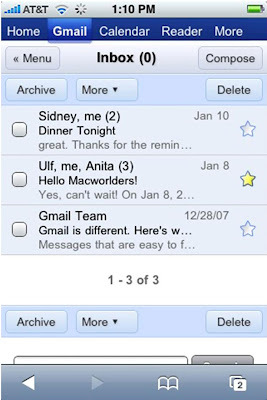 We've just released a new look and feel for the mobile version of Gmail on your iPhone. Our goal: make Gmail fit nicely as part of the latest Google on your iPhone experience. This means that we had to make Gmail faster and more fluid. To do that, we decided to use AJAX--a powerful set of web development techniques that make web pages more responsive. We also implemented two of the coolest and most requested features for this release: pre-fetching and auto-complete. Now when you use Google on your iPhone, Gmail will automatically pre-load all your most recent messages for you. So when you decide to read a message it will be on your screen in a snap. Address auto-complete is my favorite new feature--and one of the most requested. 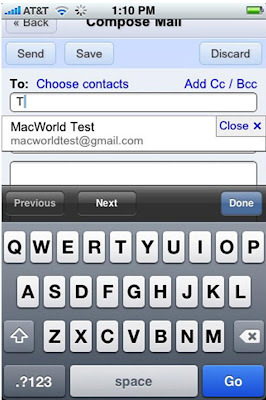 I wanted to be able to type a full email address in under two seconds on the iPhone. With auto-complete you can often get the right email address on your screen within 2-3 key strokes. Finally, our user experience designer worked hard to develop a very fluid interface that fits the whole Google experience on the iPhone. These changes take into account that you have to tap the virtual buttons with your finger, so we made sure to size everything appropriately. To get to Gmail on your iPhone and get the full new Google experience, just go to www.google.com in your web browser, hit the Gmail tab and sign in. Google Apps users with custom domains can also use this new Gmail interface by visiting mail.google.com/a/yourdomain.com. Please leave comments on the Google mobile blog and let us know what you think. I have about eight friends from high school I like to keep in touch with frequently. We all email updates or the occasional funny YouTube video to the group, but every once in a while I'd forget to include one of them or I'd accidentally use one friend's obsolete school address. I found a really useful solution for emailing small groups like this one that is easier to use with the new contact manager interface, which we launched in Gmail for IE7 and Firefox2. You can create custom "groups" of contacts so you don't have to remember individual names or email addresses. You don't create a true mailing list, per se -- it's just a simple way to email a handful of people at once. After naming your group, browse for contacts you want to add to it. You can find them by clicking "All Contacts" or by searching by name or email address. Once you locate the contact you'd like to add to your group, click on the contact name, and select the "Groups" drop down menu in the right-most pane. 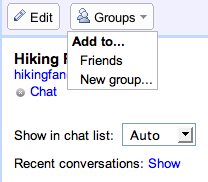 You can add any contact to a group this way -- or make impromptu new groups. (You can also add people to groups by clicking a group name and then typing email addresses or names in the search box at the bottom of the middle pane). The great thing about creating contact groups is that they "auto-complete": you can type the group name as you normally would type email addresses or contact names, and by selecting the group from the drop down menu, the group's contacts are automatically inserted. Your email recipients will not see your group name when they receive the email, but instead will see all the individual contact names and email addresses listed as normal. While this feature is great for creating efficient ways to email small groups, we encourage you to use Google Groups to manage large ones.